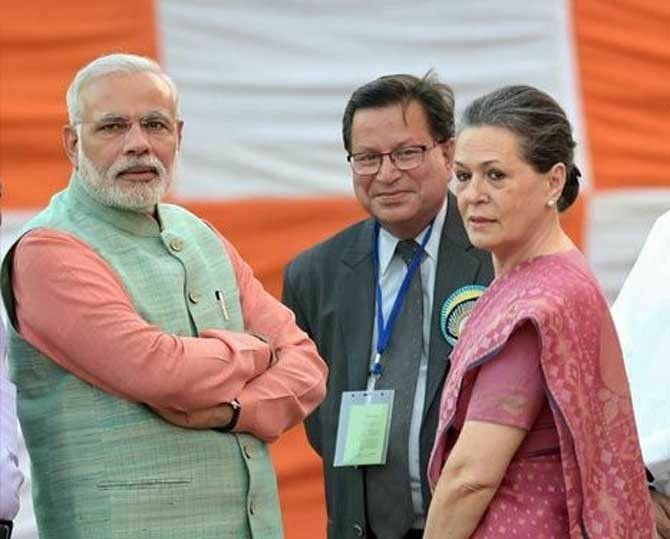 Rediff.com » News » Why do Modi and Sonia avoid the press? Why do Modi and Sonia avoid the press? Since Modi is walking a tightrope between two worlds -- one of the saffron brotherhood and the other of the proposed smart cities and bullet trains -- it is understandable why he is averse to scrutiny lest he loses his balance by tilting too heavily on one side or the other. But, why has Sonia Gandhi acquired the reputation of a sphinx, asks Amulya Ganguli. It is a tell-tale feature of the present times that two of India';s most important political figures -- Prime Minister Narendra Modi and Congress President Sonia Gandhi -- shy away from any prolonged interactions with the media. Modi, of course, makes no secret of his aversion to the press, which is why he has done away with the practice of earlier prime ministers of inviting newsmen to travel with them on their foreign jaunts. Modi prefers to take only a few from the official media with him on his aircraft. The reason why Sonia has confined her dialogues with the press to a few hurried questions and answers is not known. Perhaps it is due to her reclusive nature although there may be another explanation, of which more later. But, where the prime minister is concerned, the decision to keep the media at arm's length cannot be due to reticence since Modi's volubility is no secret. However, as has been seen, he chooses to be articulate only in controlled conditions -- at a public rally or in a hall with an invited audience or an interview which is almost never telecast live. He may speak his mind, but only to a captive audience on radio, and his pre-election chai pe charcha did not involve journalists but ordinary callers. It may not be too risky to bet, therefore, that he will never hold the kind of press conferences which his predecessor, the naturally restrained Manmohan Singh, did at least twice during his tenure. Why does Modi avoid wide-ranging meetings with the media unlike other Indian politicians, not to mention world leaders? It is possible that his dislike for the press developed during and after the Gujarat riots of 2002 when he was continually under the lens, whether of the judiciary or of the NGOs or of the print and audio-visual media. He may have been able to come through virtually unscathed although the Gulberg housing society case drags on. But Modi's unforgiving nature is evident from the hounding of Teesta Setalvad, who was involved in providing succour to the riot victims, and from having famously walked out of a Karan Thapar programme on being questioned about the riots. But what the media did or did not do during the outbreak is probably not the only reason why the prime minister likes to keep them at a distance. Another reason may be is that he is on a weak wicket on far too many political and economic issues to allow himself to be closely questioned on the lines of the BBC's Hard Talk. As a result, he may not want to answer a direct question in front of the cameras about the ghar wapsi and love jihad campaigns of the saffron brotherhood, or on the Rashtriya Swayam Sevak chief Mohan Bhagwat's claim that all Indians are culturally Hindus, or on the appointment of saffron supporters to key position in reputed organisations like the Indian Council of Historical Research, the National Book Trust, the Film and Television Institute, and so on. Since Modi is walking a tightrope between two worlds -- one of the antediluvian saffron brotherhood and the other of the proposed smart cities and bullet trains -- it is understandable why he is averse to scrutiny lest he loses his balance by tilting too heavily on one side or the other. His uneasiness is perhaps accentuated by the resistance to many of his policies that he faces not only from the opposition parties, but also from Hindutva outfits like the protectionist Swadeshi Jagran Manch and the BJP's anti-reforms labour and peasant wings. It is best, therefore, to keep the pesky newmen at bay. Modi's reluctance can be largely ascribed, therefore, to the dilemma he faces because of his transformation, in Congress MP Shashi Tharoor's words, from a ';hate figure to an avatar of progress and modernity.' But why has Sonia Gandhi acquired the reputation of a sphinx? True, as a late entrant into Indian politics in the aftermath of Rajiv Gandhi's assassination, she may have felt lost in the midst of the byzantine goings-on in Lutyens Delhi. But she gradually established her control over the party and finally even over the government as her suspected role in persuading then Prime Minister Manmohan Singh to shift the focus from economic growth to profligate populism showed. It is this transition from pro-market policies to 'socialism, which made former finance minister P Chidambaram subsequently rue the mistake of taking the 'foot off the accelerator of reforms,' which evidently puts the Congress president at a disadvantage where questions on the economy are concerned. For instance, is she pro- or anti-reforms? Does she favour a return to Nehruvian socialism and the licence-permit-control raj? Does she want to bring the private sector under the ambit of the quota system, as a Congress conclave opined in 2003? She will also be hard put to explain why the Congress crashed to its lowest-ever Lok Sabha tally of 44 despite her populist initiatives like the land law and the Food Security Act. Weren't the Congress's targeted electorate of the underprivileged not impressed by this munificent gesture? The continuing feudal trends in the party represented by the Nehru-Gandhi dynasty is another issue on which Sonia may not be able to offer convincing explanations. It is obvious that since Indian politicians, whether it is Modi or Sonia, tend to play it by the ear, as it were, where framing policies are concerned, and are uncertain on matters of ideology, they find it politically convenient to shun the media.